Is your cell phone a reflection of you? Thread: Is your cell phone a reflection of you? Very cute phone! Looks rather sophisticated too I'm getting so many ideas for my next phone! Seems like the people who visit this site have excellent tastes! Here's mine...It's a blue mint chocolate phone. I like the way it looks, but as I mentioned in another thread, we have had a few problems. Right now, every once in a while when I slide the cover back into place, it just shuts off. I'm jealous of your chocolate phone...it's a little bit slimmer than mine I think! I have a few problems with mine too. When I call my voicemail...I have to type in a password. Problem with that is that when I punch the numbers in it de-activates the lock on the light sensitive keys...so my check "pushes buttons" when I try to listen to my voicemail!!! Wow, I didn't realize that a dog would chew a phone!!! Dbexx, that's a shame! Those chocolate phones are cute, too! Are they easy to use? My chocolate phone has been pretty easy to use. It was a little hard in the beginning to get the hang of...but other than that I love it. Nadine! I can't get your green chocolate out of my mind! Wait a minute! how can chocolate be green? I think it says you are confident, bold and definitely snazzy! I think Verizon calls it..."Mint" Chocolate. That's how they can get away with it being green! Honestly I do love my green phone though...it goes well with my love of green! Jes, I think they are just a tad slimmer, and they have the little wheel on the front (dont' know how to describe it). You spin the little thing on the front to scroll through your options. I loved my original Chocolate, which was just like yours except black, but the dang thing just kept breaking, and this blue one is the one they gave me as replacement (eventually). 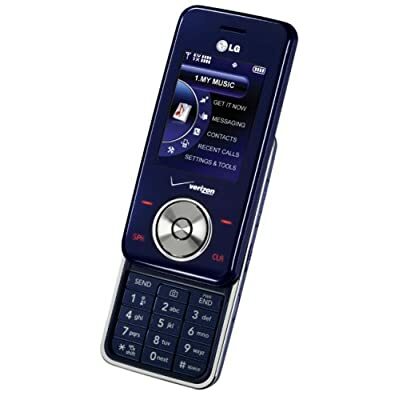 I LOVED this phone when I first got it, now Im just hoping that it will function well for longer than six months. The salesman told me they have not had any of these returned to the store with major problems YET. PS...My daughter just got the exact same phone as yours except PINK. She loves it. I think whether you get a good one or not is just luck of the draw, apparently. Do you get your email on your phone, too? That's why I have a blackberry. Treos also are Windows enabled are they not? I could get email, but I opted not to - it's much more expensive. I pretty much bought it for the calendar factor. I always need to be reminded about my meetings, hours or even days before, and the alarm helps out with that. When I had meetings written down in a planner, I rarely looked at my planner, so, I often forgot. I use a Mac, so I'm happy that Treos are also Apple compatible. hey! my cell phone is a reflection of me!!! After reading Miu's response, I will say that, IMO, there is such a thing as being "too connected". I will say that I like having my cell phone, especially now, with travelling as much as I do. It's a comfort knowing that I have it for emergencies, or to call friends to entertain me when I'm stuck at the border, but in general, it's something that I think many people in the world would be much better off without. Maybe this reaction has to do with the fact that I lived in LA for four years, with all of the self-important people who were CONSTANTLY on their cell phones...and whose conversations were just SO important that they literally screamed into their phones. Or, maybe, it's just that I remember, vividly, growing up happy and safe, without having a cell phone on me 24/7. Oh, wait, this may also be a reaction to people I know who actually answer their cells when they're in the bathroom. Having a cellphone while on a road trip is comforting. However in many remote areas of our country, there is still no signal. Fortunately I still know how to change a flat tire. I don't own a cell phone. me either! I dont own one. I use it for everything...alarm, email, texting (a ton to jenny jen, lol), calendar alerts, videos, pictures, and of course calling...alot..
At this point I'd say well over 300 texts. I finally upgraded to a smart phone late last year. I was a diehard flip phone user; you could say I am somewhat of a no frills style guy who only wants features I actually will use. Here are pics of both phones. I use T-Mobile as my carrier.